Candi Prambanan is the second most important landmark in Yogyakarta, Indonesia. First, of course, is the majestic Borobudur Temple, although Candi Prambanan is bigger. (“Candi” is a term placed before the name of any ancient structure.) If you are not sure whether you should visit Yogyakarta alone or instead of Indonesia’s popular beach destination, Bali Island, here are some reasons why thousands of tourists have already come to see Candi Prambanan, located in the Prambanan plain between Yogyakarta and Central Java. 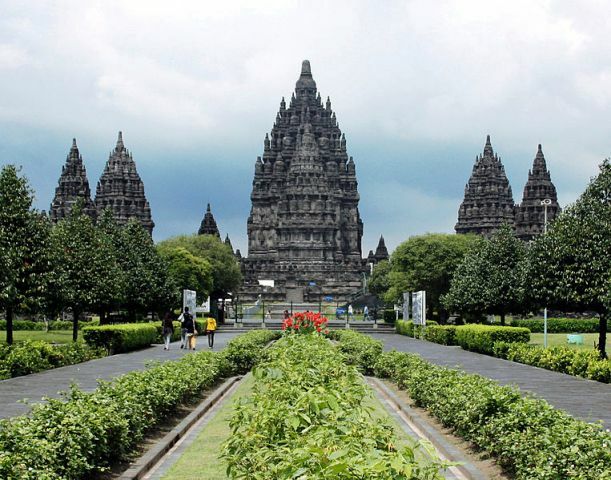 First, there is much history and culture surrounding Prambanan. If you are an enthusiast of history, archeology, architecture, Asian culture, mysterious structures, Eastern religions, temples or anything about Indonesia, then start packing your bags for Yogyakarta. Constructed in the 9th Century, Prambanan Temple is an enormous Hindu temple complex that was dedicated to the Hindu trimurti, Brahma (God as the Creator), Vishnu (the Sustainer) and Shiva (the Destroyer). It was built in 856, younger than Candi Borobudur by a few decades, by Rakai Pikatan, a Hindu prince who married a Buddhist royalty of the Sailendra dynasty-the dynasty that built Borobudur. Pikatan reintroduced Hinduism in Central Java and with it built the largest Hindu temple in Indonesia, and one of the largest in Southeast Asia. However, Pikatan and the Hindu Sanjaya dynasty soon left the area, leaving the majestic temple behind. Unguarded and abandoned, Prambanan was greatly devastated from a number of earthquakes and volcanic eruptions, as well as looting. The deterioration ended only centuries later when it was first restored in the 1930s. The second reason why you should visit this age-old temple is its sheer beauty. It was declared as a UNESCO World Heritage Site. This citation means it should be preserved for the whole world to see as an important heritage of humankind. That’s saying a lot. Its main attraction is the towering 47-meter high central building inside a wide complex of smaller temples. Within the central compound are the three lofty spires that represent the Hindu trimurti. The tallest of the three is the Shiva Temple. Around its perimeter are relief sculptures that tell the classic Hindu story of the Ramayana. Visitors may enter this temple and be amazed by the high flight of stone steps, the powerful statue of Shiva, and the statues of Durga (Shiva’s wife), Agastya (his teacher), and Ganesh (his elephant-headed son). Meanwhile, relief sculptures surrounding the Vishnu Temple tell the story of Lord Krishna and those surrounding Brahma Temple also depict the Ramayana. For visitors who may have not read or unaware of the Ramayana, the nearby Prambanan Theater presents a nightly performance on the Hindu epic. The theater is an open-air 1000-seat arena. Watching the Ramayana unfold live with Candi Prambanan Temple as backdrop is truly a spectacle. Evening performances begin at 7:30 PM from May to October for an admission fee of US$8 (75,000 Rp). Getting to Candi Prambanan is easy. Very near the Adisucipto International Airport, any metered taxi knows how to get there, since it is one of the most prominent structures in Central Java. It is about 17 km from central Yogyakarta and taxi fare is about US$10 to US$ 15. Visitors may also take the becak (rickshaw) for about a dollar.